Marawi – For countless generations, the Philippines have introduced various woven products that speak and represent our rich heritage and way of life. Weaving is a long-held custom deeply rooted in many Philippine communities, as evidenced by several weaving villages found in the country. Exceptionally regarded locally and abroad, textiles crafted mainly by indigenous communities are sought after for their intricate designs, originality, and durability. Among the Islamic kingdoms in Mindanao, the Maranao are famous for their sophisticated weaving with beautiful designs and colors. The name Maranao means “people of the lake,” referring to their ancestral territory around Lake Lanao in the province of Lanao del Sur, which is part of the Autonomous Region in Muslim Mindanao. They are the largest cultural minority, numbering more than a million. Their architecture was influenced by the Indus and Islamic religion. Long before the Spaniards arrived in the Philippines, the Maranao people already had their own culture and civilization. As early as the 15th century, Arab traders, along with Islamic missionaries and Muslim teachers, influenced native traders, who eventually embraced the Islamic religion. As a result of the fierce defiance of the Maranaos to adopt Christianity, the Spaniards were unsuccessful in their attempt to colonize the region. Hence, the culture and traditions of the tribe are well preserved. Several ethnic groups in the country are well known for their weaving traditions, and the Maranaos are among those recognized for their superior weaving. Weaving is a cultural tradition mostly practiced by women from generation to generation. At an early age, girls are trained by their mothers to learn the craft. When these young girls grow up and marry, they successively pass this skill to their daughters. Furthermore, Maranao women who have knowledge in weaving are revered in society. 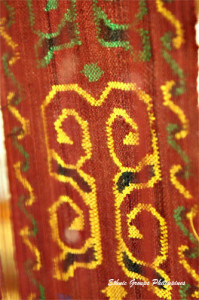 Maranao textiles are also famous for their ornate designs and colors. Their textile weaving involves traditional Southeast Asian backstrap loom weaving using native decorative ornamentation. A versatile garb called malong is a hand-woven fabric with beautifully patterned designs. It can be worn by all genders and classes, with dominant hues of gold and purple. Malong made of high-quality silk or cotton are intended for special occasions, and a yellow malong is considered to be royal or high class. The materials, designs, and colors of a malong usually determine the economic status of the wearer in the society. Landap, andon, and plaids are some of the different varieties of malong. The process of preparing and weaving the cloth is complicated, and special textiles such as silk, particularly those worn by the royals, are woven mostly by expert craftswomen. Back in the day, the social and economic significance of a Maranao can be measured by the number and classes of malong he or she owns. For most wives, weaving is an alternative source of income for the family. Unfortunately, in the last couple of years, there has been a lack of promotion of the Maranao weaving industry, not to mention the negative effect of the numerous conflicts that occurred in the region. Then again, there seems to be a recent trend that hints at the revitalization of indigenous textiles. The popularity of indigenous products are seeing a resurgence in popularity and demand on the market, exhibits, and trade fairs. With any luck, Maranao weaves will be fashionable once again.